This review is on the Fin Starter Kit (Formerly Finiti) found at my local pharmacy store, Walgreens. I purchased it on sale for around $16.99 I believe. Once I confirm, I’ll update the price. I decided to update my review since the previous kit was from about 6 years ago. And, wouldn’t you believe it, my opinion hasn’t changed much. I also order a 5 pack of menthol cool cartridges (around 15.00) since this kit only came with a tobacco single flavored cartridge. The box is really was small, about the size of a cassette case; if you know what those are, if not… think a pack of cards. Since they are available at local stores, this is a major plus. But, you can still order online at https://www.fincigs.com/. The quality of the batteries and cartomizers are not to bad. The standard at this day and age for cig-a-likes (Cigarette like ecigs). The battery isn’t great, but it’s not the worse. It does not last long, a usual user will need about 2 or three to last a full day. Since you can’t use them as they charge, you’ll need back up. I got about 2 hours of use before I had to charge, but that’s the max usage for me. A heavy user could run through a battery in under an hour. To be honest, the tobacco was probably better, but I’m not a fan of many tobacco flavors, so I’d recommend everyone who wants to try it for themselves. The throat hit is still really low. Very bad for ecigs, at least for me. Better than the first kit I got, but still once of the worst I’ve tried. Very low vapor. Again, better than the first kit I tried but still bad. The best I can say about this kit is, it’s local, for me at least. And, it’s, not that expensive if you’re in a pinch; you know, car got stuck, out of town, dropped your real ecig device and you need something to tide to over for a day or so… or till you get to an ecig store. I have just started using finiti disposables and I find them to be alright. I do agree on the taste, couldbe better, but overall I like them much better than blu. But I am also new to the vaping scene so I will have to try some others. Thanks for the review! blu’s are disgusting….so these are a whole of a hell lot better than the blu brand. Never had the kit in blu , but tried the single disposable ones. I did try the blu starter kit. It says the batteries are not fully charged at the factory. I charged them fine, didn’t take long. But that was the end of that… the charger quit working. Quality of the kit, especially the PCC is extremely poor cheap plastic probably made in Borneo or somewhere. I was in Walgreens today & they have the starter kit for sale for $39 & you get a 5 pack free. I got this kit at walgreens. I used to own Cig 2 O , which was wonderful and tasted really good, with a strong throat hit …but was really expensive for the kit (Cig 2 O was 80 bucks) but batteries died . So I bought this . I love the design , the pack and how u can charge on the go. Cig 2 o’s did not have this or anything to put the carts or batteries , had to carry them in my pocket which was annoying . The taste of the finiti kit is horrible and like u said no throat hit! there is a bit of a taste at first but after 5 puffs it’s gone and just sorta a burn taste . also , do not know when these cartomizer are empty because with others e cigs … u know when it’s empty cuz it taste burnt…well these always taste burnt. This kit would be great if they change the flavor and formula …but keep everything else the same… size etc. Thanks Crystal, I didn’t even know that Cig2O had a regular starter kit out there! I agree, taste wise this Finiti kit is sorely lacking. I thought it might be just my kit, but I see it’s pretty much universal. Volt Pro Kit which comes with a portable charger and space to hold extra carts plus has pretty good taste, in my opinion, and is pretty well priced at about 65 bucks, which would be about 59 bucks after the 10% price cut with the code. Thanks again Crystal and keep on vaping! Thr battery is similar to the 501 thread but is definitely different from what Blu uses. It doesn’t fit. Do you know what cartomizers are compatible? I like everything about these except that taste and throat hit are nonexistent. Kevin, I know what you mean. It’s a bit tough to get a Blu 510 cartomizer on the Finiti battery, to be honest, it’s tough to get ANY 510 threaded cartomizer on the Finiti battery because of how high the made their battery post. Their cartomizers are recessed a lot and it’s difficult to find a matching battery for their cartomizers as well. Having said that, I did find some Blu’s were connecting to use but they did not screw all the way down and left a big gap between them… but it was vape-able. None of my other cartomizers fit. A good 510 kit for the money is the Firebrand Millennium Mega Starter Kit. I purchased the kit.. I’m waiting for my rather large liquid order to arrive from china. I included needles, caps,. etc. All the tools I need to refill my own carts. I like the size & feel of the battery/cart. If they don’t improve the Vape mechanism, Fin will be a top rip-off candidate. I’ll be looking for this size battery,cart & Recharge case and willing to pay more for better engineering. 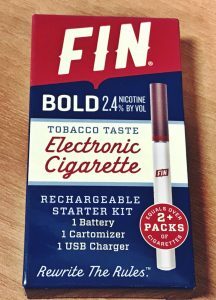 I just purchased two of these Fin starter kits last week, agree on the “throat hits” being weak and I have smoked for about 60 years so it is really hard for me to stray away from the lousy tasting cigarettes they have out on todays market. not sure what they are putting in them now. Anyway, I went through my first cartridge ok, then the battery ran out and charged it and then had to change the cartridge, 2 puffs in, the light started flashing like it needed charging. I charged it again and off to bed to watch 2 1/2 men and 2 puffs into the new charge the light started flashing again that it needed charging. So far, beyond one cartridge I’m not a bit happy with this investment. I had purchased mine as Sam’s Club. I think they were 7.95 for the starter kit with one cartridge and then the 5 refills were 7.95 as well. I am now trying the one I got for the wife and see how it does. So far, not impressed, still leaves me wanting a cigarette very badly! I’m sad to hear you had this experience. I hope you give another brand a try. Several people have had the same results you have from trying this brand. I believe you will have a much better go with some of the more popular brands. Unfortunately, they may not be in the local watering holes, but they can really be a great experience. Post back and let me know how it turns out. Hopefully you will be free from regular cigarettes. Good luck Jerry! Ok, I have been doing these things for about a week now and my throat burns like H$&L and I can’t get rid of the dead taste in my mouth. I think I’m going to try something different. not happy with the charge factor as well nor does a cartridge last as long as they say, two pack per cartridge, I don’t think so as I could never smoke two packs in one day no matter how much I puffed. Plus the charge does not stay as long as they suggest as well. basically, not happy at all with these things but I will finish the cartridges i purchased. I am cheap! lol.. Sorry to hear that Jerry! What a bad first experience. Well, if you want another kit with a portable charging case, Smokeless Image has one for a decent price. Sounds like you do enjoy e-cigs in general though, and that is great news. Hopefully, you’ll find something that will work well for you and taste great to boot. I’m here to help if you have any questions. Thanks for the update Jerry! I truly can’t understand how anyone who ever smoked real cigs could be content smoking the Finiti brand, no flavor, no throat hit, nothing! I tried N-joy disposable cig from wal-green and it had huge throat hit but for $7.99 it didn’t last long at all. Resently tried Pro-smoke, has rechargable case, great vapor, comes in different nicotine levels and the high level is so much like a real cig I don’t think I’ll ever go back to the real thing….good luck to everyone! Thank you Lynette for sharing that info. I’m really happy you found something that can keep your interests away from regular cigarettes. Happy Vaping! VERY disappointed in the money I just wasted on the complete Finiti kit as it’s horrible and no way that 5 cartridges are equal to 5 packs. I am not a heavy smoker as it is and already two cartridges are empty today. Maybe I have a dud replacement pack but this is false advertising if I have ever seen. Do they give refunds on these kits or what? Finiti is a huge disappointment and I am craving a Blu disposable bigtime right now but it’s too crappy to drive on the snowy roads right now. Sorry to hear about your experience with Finiti Debbie. I hope this leads you a better e-cig that will help yu stay off of analog regular cigarettes. Best of luck! As a 1+ month blu user, I have come to appreciate e-cigs but am just learning, so curiosity bit me when I saw the Finiti kit at Walgreens. They were local…the kit was cheap…they threw in an extra 5-pack of cartomizers…so why not? These were some uniquely lousy-tasting cartomizers! Slightly-smoky-slightly-burnt vapor with no other identifiable flavor! These were beasts to vape! I was persistent, and hoped that the 5-pack had better/fresher tasting carts…not at all…every one a dog. I was hoping maybe just a bad cartomizer or two…but now I think that is just the way they are. Wouldn’t think of offering one of these to a friend…too bad, because had they come with decent ejuice this could have been a very decent low-cost kit. I agree Pete. I really dislike the fact that one of the 2 locally available e-cig kits that can help smokers get away from regular cigarettes is not that good of an option. I hope you find something that works for you Pete so you too can remain Regular cigarette free. Happy Vaping. I am a 2 pack a day smoker and have been doing Finiti for about a week now. I smoke the rich tobacco taste and it tastes better than a real cig, easy charging system and my family enjoys the no smoke. I have tried other disposable cigs and not impressed with how big and clunky it has been. These are nice, slender and doesn’t look like I’m smoking something illegal. Thank you for not including the “throat burn” and putting added chemicals into the filters. Very happy with the low cost and will keep coming back. Yea, Nicki M, I agree. I rather prefer no “throat burn.” If I wanted to burn my throat, I’d start smoking tobacco again. I’m using the Finiti pack as well and I’ll continue to use it. Anything that keeps you off regular cigarettes are the right choice. Let’s keep on vaping! I have smoked for a little over 40 years. I have tried Njoy, Blu and Finiti Disposables and I prefer the FIniti over the other. The Blu was the worst. I have had a real cigarette for almost a week and no withdrawal or cravings for a real one. I smoked only menthol cigarettes and I enjoy all 3 flavors in the Finiti. So for now it works for me. Melissa, that is great to hear. I’m glad they work for you and hope they continue to work for you. Vape on! but a lot of vapor. Great behavior psyche. Vape on people!!!!!!!! The only thing i do not like is that the mint flavor does not taste like mint at all. I feel that is a hoax in taste.I hope the real mint flavor is available on the market. Santia, I would encourage you to try other brands and flavors. That is the real ticket to staying off of cigarettes. I hope everything works out for you, stay Vape Strong! I bought this POS and was actually angered by how disappointed I was. What a waste of $45. And ALSO don’t by this thinking you can exchange if it craps out on you literally half a day later. Walgreens won’t return or exchange. Such a disappointment. Hi Mary, I’m really sorry you had to go through that experience. Hopefully, you try a better e-cig and continue on the non cigarette road with less bumps. Vape strong! I bought my kit in January 2103. It took me about 2 weeks to learn to smoke with this, and for a while I thought it was great. I was able to get a refill to last a week, maybe 10 days. Then I noticed that the refill kits (5 refills for $15) almost invariably had one dud in them. Also, I had to get the cord in the charger put in “just right” before it would begin charging. And now I have noticed, after 7 months, that the batteries are losing there ability to hold a charge. I used to use them for about a week. Now they won;t go for more than 2 days. And the batteries are difficult to get into the recharge slot — if you don’t get em in just right and don’t notice it, you will be out of luck for 2 hours. So now I gotta consider buying a new kit or switching brands. The good thing? I have quit smoking!!! Congratulations B Heaston! I’m so glad you are off the analogs cigarettes. And I’m sad to see you ran into issues. Try another brand, one that’s well known, and I’m sure you will have better luck. Best of luck and Vape Strong! I’ve had the same problem with the batteries wearing out quickly. Right now I’m at about three charges per cartomizer. I’ve learned how to refill the cartomizers, if I could only find some decent replacement 510 batteries, I’d be in bette shape. Can anyone tell me where (if) I can get some? I had the Metro and Vuse brands and both disappointed, and i remember seeing this one for 40 bucks at walgreens. the price was actually down 20 dollars when i got it so it was a GREAT deal. so far i like it i think i found a system that works for me. My Finiti starter kit was only 19.99 at Walgreens. I can also use the Blu cartridges on my Finiti. After reading all the “this is great” reviews, i purchased the finiti starter kit. I have 1 good thing to say, the price was great. However, the rechareable wont last more than couple hours, the cartidfes last even leas than the rechargeable. Also, when you go to use it, the hole in rechargeable to draw air has to be covered to even remotely get anyyjing and then you have to draw so hard it ends up giving you a headache. I STRONGLY disagree that this is as good or better than BLU. i purhased an extra pack of cartidges and have 2 left after 2 days. Now before i get bombarded with responses, i only used each cartidge for aporox. 2 hours. BIGGEST WASTE OF MONEY IVE EVER SPENT! They have the starter kits on sale at Walgreens right now for $14.99. I just bought one today. I couldn’t believe the price when I saw it but its true only 14.99 and you can not find a better deal than that anywhere. They had 3 or 4 left at the store I went to and I am thinking about going back and buying the rest of them for friends and family. Also for those of you that do not know, you can actually refill the cartridges with the liquid refills that you can buy at many tobacco stores and others. This also allows you to change flavor and strength. You can continue to refill and use them until the atomizer goes bad. I have refilled them several times with no problems and works great. A lot cheaper too. I get 3 bottles for $10.00 at the liquor store where I live. (each bottle contains 15ml of liquid. Great deal!!! I have purchased the Finiti kit at Walgreen store and one of the refills is stuck in the box so i cant use it. Last night i went to get a disposable ( regular ) electronic cigarette :it says equal to almost 2 packs, y smoked three puffs (3) and the cigarette smoke is gone !!!!! I am not happy with this situation.. Advice…….!!! 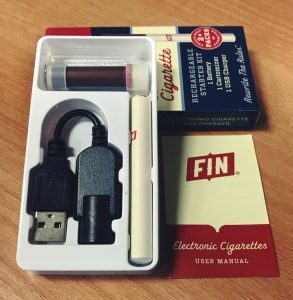 Did you ever find out if the Fin carts work with the Finiti? Wondering if those carts taste any better. I just purchased the starter kit as well. The information packet that comes with the 5 cartos, state that these cartos stay fresh up to one year? Is that if you never use them? Or useable they last for one year? Can you elaborate please? Also, I believe there is something wrong with the pcc is it? that cigarette looking device that charges the batteries? When I plug it in, the red light does not come on for at least 10 min. When the light turns green, im thinking, oh boy, oh boy, oh boy, however, after about 10 to 15 minutes later it starts blinking, and hardly no vapor or none at all. And the “throat hit” non existent. Now if I have a deffected machine I dont even think I can get a replacement cause I have no receipt. I do have the box with the upc on it, i think. Anyway, can you check into that for please? Otherwise, I guess i’ll have to purchase another brand. Thank you. This web site, listed on FINITI manual, does not seem to be valid. My starter kit wasacceptable, but only one battery worked and I would like to order another. Any help? I bought the starter kit and all of the delivery filters were dead, luckily I bought some refills and a few of them were dead as well. I found that I had to pull extremely hard to get a throat hit . I am absolutely disappointed with the FINITI brand and will not be purchasing any more refills and I will not be recommending them to anyone who wants ecigs .I had hoped that they would be a good idea to help me quit smoking real cigarettes, but all I am is disappointed with the product.